Three of the Cuban Five have been moved to a prison in Miami, where they are expected to be resentenced on Oct. 13, their supporters say. The three who were transferred are Antonio Guerrero, Fernando González and Ramón Labañino. Is Bill Richardson carrying a message from Obama? With New Mexico Gov. Bill Richardson in Cuba, a diplomatic dance has got to be going on at some level. But whether it will lead to any change in U.S.-Cuba relations is difficult to know. 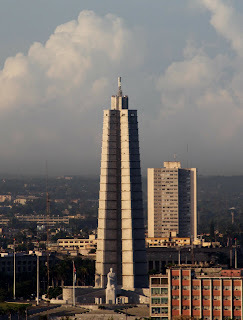 Governors do not wake up, decide to travel to Cuba and fly to Havana the next day. These kinds of trips require advance planning. That means talking with Cuban officials. Naturally, the Cubans will ask, 'Why would the governor of New Mexico like to come to Cuba?" So the two sides talk. That in itself can involve some negotiations over the purpose of the visit, the agenda and who the governor will see in Cuba. Questions will come up about whether the governor will seek a meeting with Fidel and/or Raul Castro. Most VIPs aren't guaranteed an audience with Fidel Castro in advance. Underlings can't promise that kind of thing because, in the end, Fidel Castro does what he wants. Richardson's prior contact with Fidel Castro could influence things, but that was more than a decade ago. Some members of Castro's inner circle have changed and I'd guess that his circle has grown smaller since he fell sick in July 2006. I'd be surprised if Castro agreed to a meeting in advance. That said, I think it's possible that Richardson will see Fidel Castro and less likely he'll see Raul Castro. Raul Castro is the president. A meeting with him heightens the expectations. That doesn't seem a likely step. Sitting down with the former president, now retired, is less complicated. "Make no mistake," one Cuban official told me earlier this summer, "Raul Castro is in charge." Maybe Richardson is carrying some kind of private message from the Obama administration, or from Barack Obama himself. Or maybe not. Back-door diplomacy with Cuba goes outside Richardson's role as governor. Conservative politicians could use it against him in the future. Behind-the-scenes contact with Cuba could also hurt Obama. Career diplomats at the State Department might feel insulted and conservative talk radio hosts would have more reason to paint Obama as a radical. To be sure, a vocal minority would go ballistic if Obama pushed for normalization of relations with Cuba. The majority of Americans may want that, but it's a can of worms for the president. It's also complicated for Cuban officials, not all of whom want to end the Cold War just yet. If the Richardson visit ends without a peep about diplomacy or U.S.-Cuba relations or the embargo that doesn't mean nothing happened. If Richardson has a secret or private diplomatic agenda, it may not be made public for some time. But if Cuba releases some political prisoners a month or two from now, we ought to consider whether Richardson played a role. At the very least, someone in the Cuban government will try to pick Richardson's brain about the Obama administration and its plans for Cuba. That will happen early in the visit or maybe they've done it already. Any information would likely be relayed to Fidel or Raul Castro in case Richardson does secure a meeting with either one. 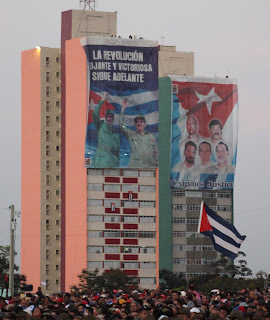 All this said, the socialist government doesn't embrace Richardson's past stance toward Cuba. He supports conditions on whether the U.S. lifts sanctions. He has said Raul Castro must release political prisoners "to show his sincerity." Cuban officials have said they won't accept any conditions. They see the U.S. as the aggressor and believe the U.S. should unilaterally lift the embargo. So even if Richardson wanted to make diplomatic inroads, it wouldn't be easy. We need to strengthen energy cooperation in the region as well as we foster democracy and fair trade. And fostering democracy must include Cuba. We should reverse Bush policies restricting remittances and travel to visit loved ones – family reunification. Raúl Castro has started to make some overtures towards the United States. Let’s challenge him to show his sincerity by releasing Cuban political prisoners. Our most important objective with Cuba right now is how can we positively influence the transition to democracy? That should be short term. Do we take the embargo out now? No. But what I would do is I would challenge Cuba. Raúl Castro is sending messages: We want normalization of relations. Okay, here’s something that you might do: release political prisoners – journalists, dissidents. Those are the steps that I would take. But what I would also do is I would have a plan for that democratic transition. I hope the Bush administration has one. 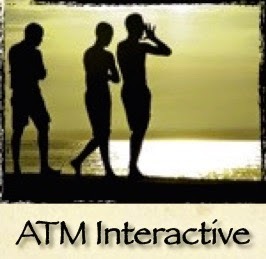 Because I believe as the Cuban people get more American contact and travel and all kinds of initiatives – I don’t understand the Bush administration saying, we’re going to cut down on travel – family travel and remittances. People-to-people contacts strengthen nations. So those are the steps that I would take. Taking the embargo off I believe is premature. I think there has to be a negotiation. I would get leaders of foreign – former presidents of Latin America to help me visualize a policy for a post-Castro Cuba where you push for a democratic transition, where you push for democracy, where you push for fair elections, where you push for long-term viability of that country and reintegrate it into the Americas. I think Richardson may be paying his own way because Cuba is such a political lightning rod. Maybe, as it turns out, he's not feeling quite so bold. But at least he's making the trip. More American politicians should follow his example. New Mexico Gov. Bill Richardson is spending the week in Cuba "and he's paying his own way because of the state's budget problems," the Associated Press reports. He was due to fly to Havana today and return on Friday, his spokeswoman told the AP. * Department of Finance and Administration Secretary Katherine Miller. * Richardson Deputy Chief of Staff Gilbert Gallegos. This is being touted as a trade mission and nothing more. But if anyone can make diplomatic inroads, it's Richardson. Over the years, he's been a diplomatic troubleshooter in many countries, including Iraq, North Korea and the Sudan. He's the former U.S. ambassador to the United Nations. 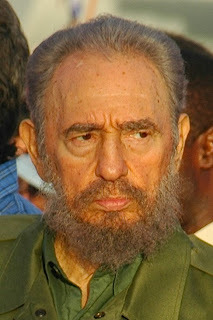 He met with Fidel Castro in 1996 and negotiated the release of three political prisoners. 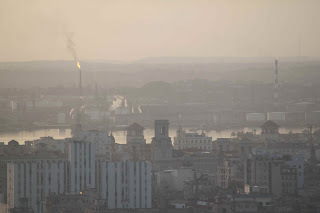 Cuban government plans dramatic changes, but when? 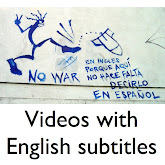 ¿Hasta la victoria, pero cuando? 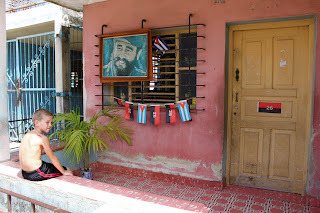 While in Havana earlier this month, I met with a Cuban friend I've known since the mid-90s. He's sharp. He's an expert on U.S.-Cuba politics and I'd say he follows what's going on in Washington more carefully than a lot of Americans. With great calm and confidence, he talked about change and the future direction of the socialist government. He told me the Cuban government plans to "depart from some of its traditional ways" in the future, taking steps that were once "unthinkable." He didn't explain in detail what he meant, but I took that to mean that the government plans economic reforms or a new economic direction at some point. My friend said while the Cuban government would like the United States to lift economic sanctions, the status quo gives Cuban officials some breathing room, some time to make these changes. I was thinking about that conversation this morning in light of the new video showing a healthier looking Fidel Castro meeting with Venezuelan lawyers over the weekend. I try to stay out of the prediction business, especially when it comes to Cuba. I don't know how long Fidel Castro is going to last. None of us knows when that moment is going to come, when we're going to hit by a train or fall off a cliff. It could be tomorrow or next month or next year or five years from now. 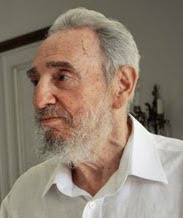 In the video, Fidel Castro looks healthy for a man of 83. Obviously, he could live a number years longer. Longevity is in his genes. 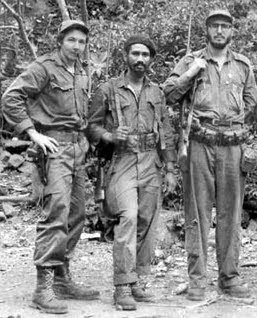 His older brother, Ramon Castro, is expected to celebrate his 85th birthday on Oct. 14. All this raises questions. If indeed these "once unthinkable" changes are going to happen, what's the timetable? Are officials waiting for the Comandante's demise? Or are they going to plunge ahead while he's still alive? Now I know Raul Castro has already taken some steps. He's trying to boost agricultural production in the countryside. The government is giving away land to people willing to work it and is counting on private farmers to boost the economy - see a story about that here. Raul Castro is also trying to improve government efficiency, consolidate some agencies and offices. That's all important. 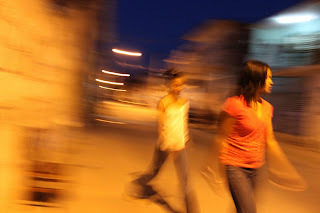 But I think a lot of Cubans are hoping for more change faster, and that doesn't seem to be happening. What many Cubans seem to be clamoring for, for starters, is simply more freedom to work, to start their own small businesses and make money so their lives can improve. 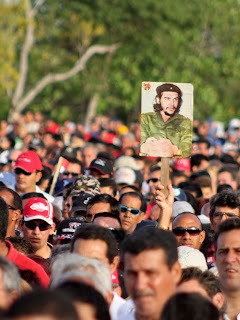 Cubans want change. They want action. The longer the government waits, the less political support it will have and the more it will need to rely on force to hold things together. Use of force will only erode political support further, requiring - you guessed it - more force, not just police, but use of CDRs, mass organizations, pressure in the workplace, information campaigns, travel restrictions, etc., to hold things together. Cubans walk everywhere and it helps them stay fit. That must contribute to Cubans' average life expectancy - 75 years for men, almost 80 for women. The average is 77.45 for men and women, ranking 55th in the world, according to the CIA's World Factbook. Life expectancy in the U.S. averages 78.11 and ranks 50th. 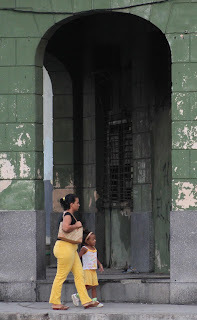 The woman and child shown above were walking past the Partagas Cigar Factory, behind the Capitolio. Partagas, along Calle Industria, is reputed to be Cuba's oldest cigar factory. 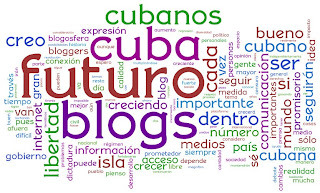 A Wordle cloud showing how bloggers responded when asked about the future of blogs in Cuba. 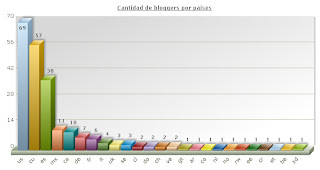 Aguaya, a prominent Cuban blogger, has released the results of a poll of more than 200 people who blog about Cuba. 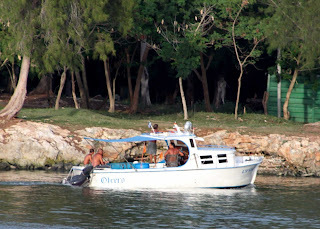 Among the findings: 75 percent of Cuba bloggers polled don't live on the island. Aguaya, a college professor in Germany, writes a blog called Desarraigos Provocados. 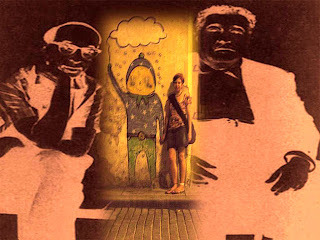 She helped lead a conference for - and about - Cuban bloggers from Aug. 14 to Aug. 16 in Palma de Mallorca, Spain. The event was called Blogueando a Cuba. 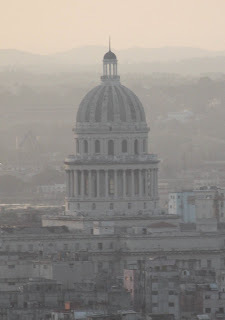 I think blogs are an important force in discussing Cuba and, as a journalist interested in Cuba, I would have loved to have attended the conference. Unfortunately, I had other commitments. But I did fill out Aguaya's survey, which I think makes a valuable contribution toward our knowledge of Cuba-related blogs. 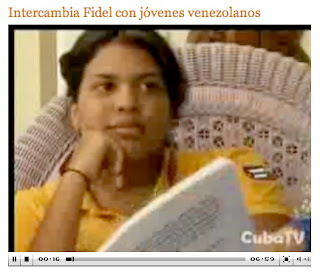 I know that Cuban officials have criticized many Cuba blogs, calling them biased, negative, even malicious. They've also said they believe some blogs are financed from abroad in an effort to discredit and destabilize the socialist government. Whatever the case, blogs aren't going away. They'll only grow and I think they'll be - and probably already are - impossible for Cuban authorities to control. Cuban officials have responded by sponsoring and supporting pro-government blogs, but the information war only goes so far. The best way for authorities to respond to bloggers is to find solutions to the country's economic and social troubles. Fidel Castro met Saturday morning with a group of recently graduated Venezuelan lawyers. 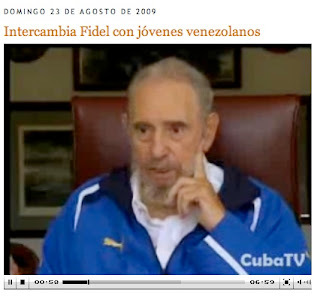 State-run Cuban television ran some video clips of the meeting, which lasted more than three hours. 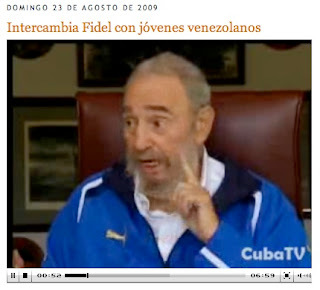 I don't recall seeing this much video of Castro talking in quite a while. It is interesting that the former Cuban president chose to meet with Venezuelan lawyers and not Cubans. I wonder if any young Cubans object to that. During the meeting, Castro spoke about global environmental problems and other matters. One of the lawyers promised to support Castro and defend his revolutionary ideals. 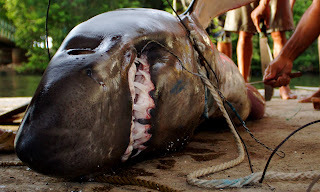 Something has to be done...they can't do this to us....let's not quit until they return Skype to us. 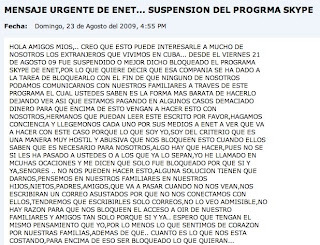 The message blames ENET, which is the Internet company for the state-run phone company, ETECSA. I haven't seen whether ENET has responded to the complaint. ...You can utilize the VPN technology to by-pass the installed censorship filter and unblock Skype. You can either setup your own VPN server or buy VPN access from existing VPN service providers on the market. You can also strengthen the security while using VPN connection on the road because the communication between the VPN server and you is always encrypted. 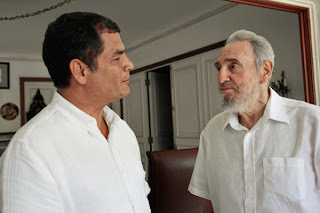 Fidel Castro and Rafael Correa Delgado on Saturday had a "profound exchange of ideas" on their countries' "pursuit of greater equity and social justice," Juventud Rebelde reports. The meeting lasted for several hours, the newspaper said. Castro wore a short-sleeved shirt, not a warm-up suit, which he's worn for most photo ops since falling ill in July 2006. Correa speaks in Havana on Jan. 8, the 50th anniversary of Fidel Castro's triumphant march into Havana after Fulgencio Batista fled the country. 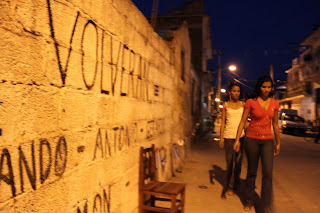 Handwritten signs, posters and billboards throughout Cuba demands the return of five Cuban agents held in U.S. prisons. 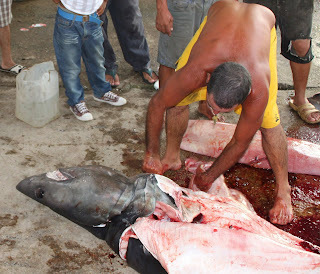 I took these photos in Holguín. "Volverán" means "They will return." The agents are named Gerardo Hernández, René González, Antonio Guerrero, Ramon Labañino and Fernando González. 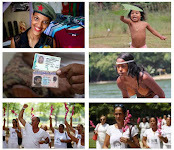 They are seen as heroes in Cuba for giving up their freedom in exchange for defending their country. The agents' supporters in San Francisco are holding a rally for them on Sept. 12. It's legal to import art from Cuba, but that didn't happen by accident. More than a decade ago, the Center for Cuban Studies in New York organized a lawsuit against the Treasury Department. Lawyer Michael Krinsky, the National Emergency Civil Liberties Committee and joined in and were successful, making it legal to bring in art from Cuba despite the longtime U.S. ban on trade. 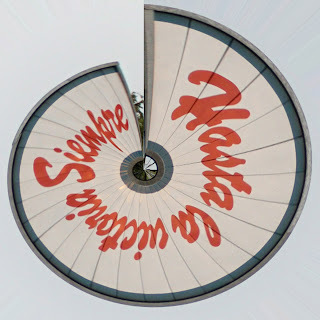 A little non-profit center called the Cuban Art Space opened to show nothing but Cuban art. It had no money, so its director, Sandra Levinson, went to Los Angeles in July 1999 and held a fundraiser and art sale. Some big names in Hollywood pitched in. Among them: Harry Belafonte, Francis Coppola, Benicio del Toro, Danny Glover, Jack Lemmon, Sidney Lumet, Cheech Marin, Jack Nicholson, Gregory Peck, Sydney Pollack and others. The event brought in $50,000 and Levinson used that money to open a gallery on West 23rd Street almost 10 years ago - on Sept. 8, 1999. 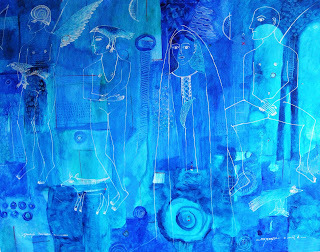 Since then, Cuban Art Space has presented 75 exhibits of Cuban art. The center has also moved into smaller quarters on 29th Street in New York and plans an exhibit there next month. 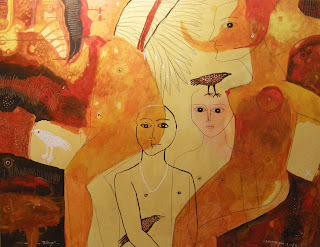 It will display work by José de Jesús García Montebravo. He's 55 and is a self-taught painter from Cienfuegos. 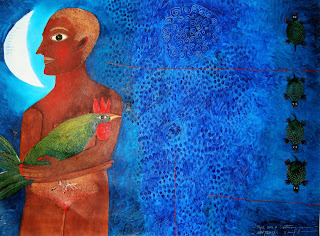 He goes by the name Montebravo and is known for paintings showing images related to Santería. Cuba has world-class athletes in dozens of sports. Rollerblading isn't terribly common, at least not yet. 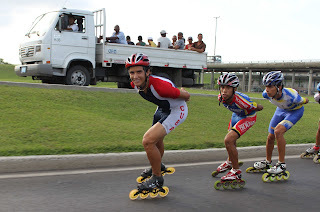 A September 2007 article in Juventud Rebelde said about 3,000 young Cubans practiced rollerblading, skateboarding and other "extreme sports." Coming up with enough money to pay for equipment is a problem, the newspaper quoted sports officials as saying. 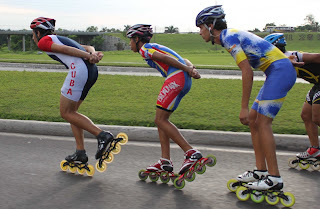 These inline skaters were training on a road outside Havana. Cuban women "are made for beauty and not to take blows around the head," Cuban head boxing trainer Pedro Roque told Cuban reporters. We have no intention of participating for the moment in any international competition as we consider this discipline is 'inappropriate' for women. Renata Cristina Dos Santos Ferreira punches Adriana Salles. 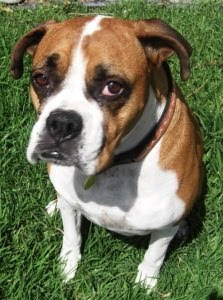 One last female boxer - and this one's available. Credit: Boxer Orange County Animal Rescue Inc.
Juan Almeida García, son of revolutionary comandante Juan Almeida Bosque, was detained Thursday "as he strolled through Revolution Square with a sign that said he wanted an exit permit to leave the country," according to Cuban Colada, a Miami Herald blog about Cuba. was released a couple of hours later with a promise that his request will be answered. Almeida was arrested May 6 after attempting to flee in a boat and given supervised parole. Since 2006, he has asked the authorities repeatedly for an exit permit that would enable him to seek medical treatment abroad for a rheumatoid disease he has had for years. His wife and daughter live in the United States. Almeida's 82-year-old father is Vice President of the Council of State. 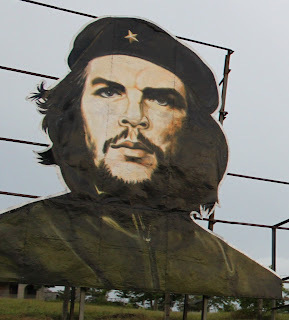 He's one of the heroes of the Cuban revolution and led a rebel contingent in Santiago de Cuba. 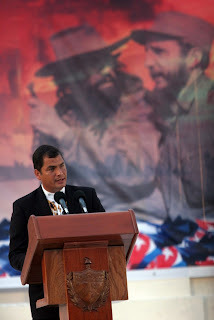 Wikipedia says Almeida is also head of Cuba's National Association of Veterans and Combatants of the Revolution. More photos of Almeida from his revolutionary days are here. I read Almeida's letters on El Nuevo Herald's Web site. They give me a better understanding of why he wants to travel to the U.S. He said he had been asking for an exit permit for five years, but has not gotten an answer. As he waited this summer, he said his mother-in-law in the U.S. died of cancer. He also says he has a skin condition that he says requires treatment abroad. So he took the rare step of protesting in public. I wonder why the government wouldn't let him leave. There must be more to the story. Update: Indeed, there's more to the story. 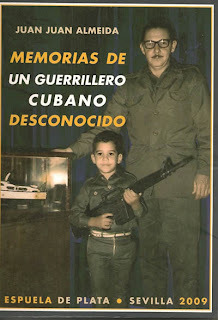 Almeida wrote a book critical of Cuba's political elites. A Spanish publisher is selling it online. The book cover is below. Psst...hey, buddy... Wanna a Ford Fairlane? A reminder of Chevrolet's better days?